We're big fans of paint, with painted kitchens the top of our wishlist – and for good reason: they create a bespoke look that needn't cost a fortune. Whether revamping an old kitchen or starting from scratch with ready-to-paint replacement doors or kitchen units, painting kitchen cabinets is well within the capabilities of DIYers. Or, if budget allows, you can shop for a ready-painted kitchen, with many manufacturers allowing you to specify the exact paint shade to suit your scheme. Kitchen cabinets already in? Transform your kitchen quickly with a new wall colour. Our favourite kitchen paint ideas are below – and if you are designing a kitchen from scratch have a read of our dedicated feature filled with practical advice too. One bold colour all over can lack interest, so why not try picking a few shades of the same colour to use in one room? Put the darker shade on the cabinetry and the lighter on the walls for a fresh, bright finish. This lovely fresh blue-based Mt. Rainier Gray (2129-60) on the cooker wall is a great choice for a light and airy kitchen and the deeper shade of the Normandy (2129-40) painted units perfectly complements the colour scheme. The hallway wall is painted in a pretty sky blue shade called Breath of Fresh Air (806). The white gloss floor adds balance and gives the room a spacious feel. If you are looking to give your kitchen a refresh on a budget you can easily paint your kitchen cabinets yourself, just follow our guide. Struggling to choose between two colours? Then, why not have them both? The key is to find a feature the colours have in common - in this case, they share the same tone (in other words, light value). Putting the warmer kitchen paint colour on the walls - which have a greater surface area than the cabinets - will create a more inviting feel. The wall paint used here is Antoinette from Annie Sloan, it works perfectly when paired with the darker, aubergine hues of the kitchen cabinets (a mix of Annie Sloane Aubusson Blue and Emperor's Silk) as it gives the pastel hue a more modern look. Deep, dramatic alternatives to grey - green, burgundy and blue - are very popular paint colours for kitchens, creating an elegant appeal, an effect doubled if used on both cabinetry and walls. Kitchens with good light and high ceilings can take the darkest of paint colours, such as Farrow & Ball’s Stiffkey Blue Modern emulsion (shown here on the walls and floor); an eggshell finish in the same colour has been used on the units. Keep the finish sophisticated with a smart, contrasting white – Wimborne White is the perfect choice - and add a pop of colour in accessories to lift and modernise the scheme instantly. Love this kitchen? Don't miss our dark and dramatic kitchen design ideas. Although they are a hive of activity, our kitchens are increasingly becoming spaces we relax and socialise in. However you use yours, colour can aid the serene atmosphere of this space. This peaceful, barely-there grey paint colour on the walls is called Brushed Buckle by Dulux. It has a warming tones to make it welcoming but is light enough to create an illusion of space – ideal if your kitchen is small and on the dark side. The units trim is called Rail Cloth and adds an extra interesting element to the scheme, while the middle section is painted in Pure Brilliant White. Traditional style cabinetry suits the painted look perfectly. Shaker-style units lend themselves to a splash of colour just as well as very contemporary, high-gloss cupboards, so don't be afraid to embrace a new shade. When you invest in a Neptune kitchen you get the fabulous option of choosing from their range of 28 original paint colours. They are ecologically-friendly and water based, with a choice of matt emulsion or eggshell finishes. Shown here is their classic pared-back Suffolk kitchen that’s hand-painted in Sage – a calming green that has a fresh, timeless feel. We have loads more inspiring Shaker-style kitchen design ideas if you like the vibe of this kitchen. You can’t beat an all-white kitchen– bright and crisp, it acts as a blank canvas for the rest of the scheme, enabling you to add and swap out accent colours quickly with accessories. It also means the kitchen will be far easier to update and match to new utensils, appliances or dinnerware. In this deVOL kitchen the cabinets have been painted in Damask and the walls and shelves have been kept the same shade of white too. The choice of wooden flooring however keep the kitchen from becoming too clinical, which we fully recommend doing if you are going to go down the all white everything route. Glossy, bright, apple reds are making way for a new team of more muted hues – think plum, oxblood and vermillion. Paired with sleek, contemporary units, they offer a demure, but modern kitchen paint alternative to anything high-shine or in your face. This Linear design from Harvey Jones has a modern look with steamlined units. You can choose any paint colour you like, and they will hand-paint it on for you; shown here is Fired Earth’s eggshell Dragon's Blood. One advantage of doing this is that if you get tired of the colour after a few years you can give your units a new lease of life by re-painting them. If your units are modern and white, choosing hotter kitchen paint shades for the walls will visually warm up the space. This allows you to embrace the modern look (and easy-to-clean nature) of minimalist white cabinets, without being left with a clinical feel. On the right wall Toffee Apple adds warmth, while Spice Jar is a unifying, neutral option. A really fun element to add to a family kitchen is to have a wall of chalkboard paint. It might keep the kids amused under your watchful eye, or can be used to leave notes and shopping lists. Annnd, chalkboard walls needn't always be black, here Benjamin Moore's Gettysburg Gray has been used as an alternative. You can really easily DIY a chalkboard, head over to our step-by-step to find out how. We couldn't put together a kitchen paint trends piece without including the classic grey. Literally, will our love for this colour ever end? Grey does undeniably work great in a kitchen especially if you want to keep things neutral but want to be a tad braver than just going for white or cream. Try using a few different tones of grey to break up a wall of cabinetry, or choose a different colour for a kitchen island. And if you want more grey kitchen inspiration, we've got a feature filled with ideas you are sure to love. Love that? Here's another grey kitchen right at the other end of the spectrum. We love, love, love the contrasting painted chairs that are set off perfectly by the grey. More on painting furniture in our step by step guide. Olive green and salmon pink? Who knew it could look so cool? To recreate this look, try painting your kitchen in Farrow & Ball's Calamine and Card Room Green. And if you want more advice on how to make these contrasting colours work go and check out how you can use a colour wheel for interior design and colour scheming. Small kitchen? It doesn't mean you can go big on the paint! Check out @hardcastletowers brave small kitchen. For a similarly glorious turquoise try painting your kitchen walls in Dulux's Marine Splash and use colourful kitchen accessories and appliances to add even more pops of colour. Love the the retro vibe of this kitchen? Go and check our more of our retro kitchen ideas. Terracotta walls have been a huge kitchen paint trend so far this year. Bit less garish and orangey than the colour that graced many a home during the '80s, think Mediterranean vibes, rather than your Grandma's kitchen tiles. It's earthier, warmer and a whole lot cooler. We love Dulux's Toasted Terracotta, especially when it's combined with brighter reds like Dynamite Red. Give a north-facing kitchen a warm glow with orange paint, yes we did just say orange paint. Not normally a four wall colour we know, but look how it works here in this slightly darker kitchen. Choose something more muted like Arancia from Graham & Brown, and pick a more neutral colour for your kitchen cabinets. A kitchen that's stained, painted or lacquered in black makes for an astonishingly cosy and comforting space, especially if matched with beautifully grained wood for that much-needed texture and warmth. Going for this look? Ensure the room gets lots of natural daylight and that the artificial lighting is perfectly planned. Get more ideas for dark and dramatic kitchen in our gallery and find out how to plan kitchen lighting in our practical guide. Take our tour around the rest of this candy coloured kitchen and for more pink decorating ideas check out our feature. Don't forget about your ceiling when thinking about kitchen paint ideas. Keep your walls neutral and add a pop of colour with your choice of ceiling paint. The chalky finish works perfectly in this farmhouse-style kitchen but your could be bolder if you are feeling brave – dark, deep colours look amazing if you have lofty ceilings in your kitchen. Check out our guide to how to paint a ceiling. Which paint colour to choose for your kitchen? Dark colours, including grey and black, are popular, with wall colours often contrasting to add impact. If you would rather keep your cupboards light and neutral, a pop of colour on the walls will be much easier to update, should you wish. 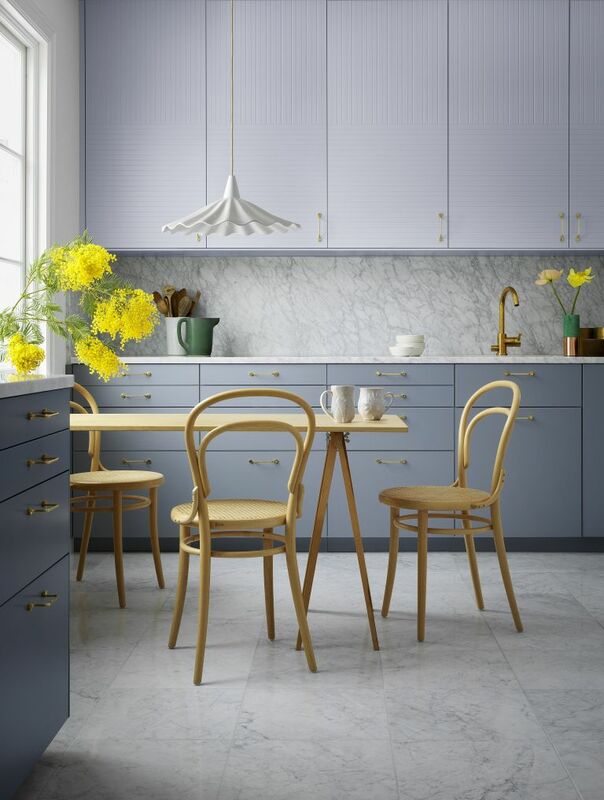 And if you're painting your kitchen cabinetry a bold colour, consider limiting it to a short run of units or a kitchen island, with a more neutral shade on the other cabinets; this will be ultimately easier to live with – and change in the future if you want a new paint colour. Which paint to use for kitchen cabinets? Looking for the best paint for kitchen cabinets? A good eggshell will be tough enough for units, while modern emulsions will work for walls, ensuring that they are still wipeable. However, there are some fabulous speciality paints for kitchens on the market which can be a good option if you have a young family. Both Crown and Dulux have good ranges if you want wipeable, grease-resistant paints.